Welcome to our website. Here you will be able to find information and suppliers of all types of screwdrivers and screwdriver sets that will allow you to do the work at hand. Stripped screw heads are a common problem, but most of the time it's the screwdriver and not the screw that's the problem. With a wide variety of choices and manufacturers, the proper screwdriver set will provide the correct screwdriver for the screw to be tightened or loosened without damage. It is always tempting to make do with the size that's handy but it is always better to have a correctly fitting screwdriver. 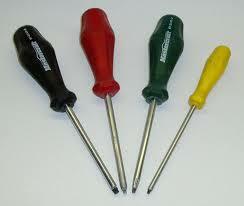 It is desirable to have several screwdriver sets for the screws most commonly encountered. To avoid damaging the screw, it is important to press the tip hard into the screw when tightening. Screwdrivers come in many different sizes from tiny jeweler's screwdrivers up to those with a tip greater than one inch. Also, there is no such thing as a "left-handed screwdriver" since a screwdriver can be equally accommodated with either hand. In years gone by, many apprentices have been sent to retrieve a left-handed screwdriver!